Need a full on front shot and one from the side also. Till then I'll reserve my opinion. Now that looks a hell of a lot better then just the box. I like that bumper its really nice. I don't have a side view, but it has an 8" winch box in front of the cross tube, which is what the KMA has, so it doesn't stick out any farther that theirs. I like that a lot. Especially the provisions for auxiliary lighting. I don't know whether or not a winch is in my future, but I could see myself retrofitting a lock box in the center to keep some recovery equipment out of the cargo area. 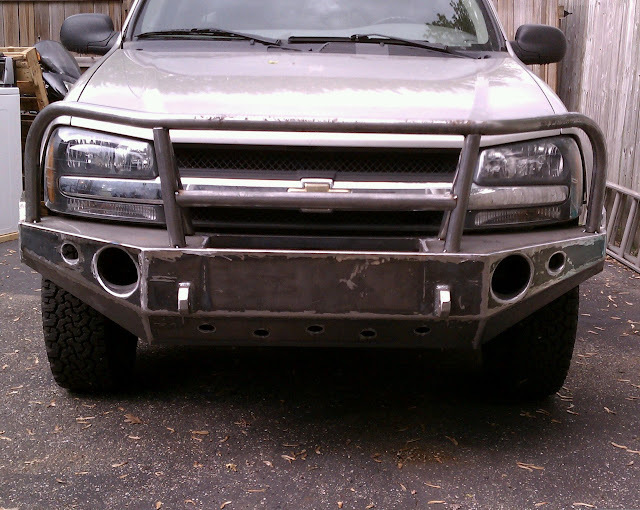 The more I think about building my own bumper, the higher you set the bar. Noice work, once again. I like it... waiting for the whole tube tucked-in version though. Philberto wrote: I like it... waiting for the whole tube tucked-in version though. that thing looks great. It looks like the top tube is up a little higher than the hood, I expect to not interfere with the headlights. Does it obstruct your view very much while driving? navigator wrote: that thing looks great. It looks like the top tube is up a little higher than the hood, I expect to not interfere with the headlights. Does it obstruct your view very much while driving? The front on pic gives a better idea of how it follows the grille lines. I agree, it does look good, Passenger side seems slightly higher than the drivers on the tube across the center hoodline, but that may just be the angle of the pic. Looking forward to see a complete product all done up and on a TB. Diacom wrote: ....Looking forward to see a complete product all done up and on a TB. I would run a chrome dipped one if it wasn't so damn expensive. Blinding people with bling. Would hold up better than paint. Looks real nice. I just might have to pick one up someday. All tube, no provisions for winch, tucked as close to the body as possible, ditching the plastic gril and maximizimg approach angle. I'll be in touch with you about such a creation in the next month or two. bartonmd wrote: whole tube tucked in?? Philberto wrote: All tube, no provisions for winch, tucked as close to the body as possible, ditching the plastic gril and maximizimg approach angle. I'll be in touch with you about such a creation in the next month or two. You're going to have to mod frame/radiator to get much better approach angle than Mike's "normal" bumper has. I wanted the same thing as you (but with a winch) and ended up with the monstrosity that I have now. Anything more and you have to delete some frame rail. I may cut out my impact tube like ChevyCrew did and mount my winch in there, then do something around that. ...Or maybe I'm not following you? IIRC, Phil and I talked about the bumper protruding no more then needed past the frame. Thus no room for a winch but a much greater angle of approach. Sort of the lines of teebes without the winch, set inward. bgwolfpack wrote: IIRC, Phil and I talked about the bumper protruding no more then needed past the frame. Thus no room for a winch but a much greater angle of approach. Sort of the lines of teebes without the winch, set inward. Yeah, I'm planning on modding frame/radiator mounting, moving or removing impact bar, and finally solving the radiator problem once and for all. Winch is a nonissue, cuz it's gonna be mounted in spare tire area per thetrick winch system I've posted about before. If you haven't read of it, google "foer vector winch system".